The Data Domain Appliance Series delivers the highest throughput and scalability of any deduplication storage system in the industry and was designed to be seamlessly and cost-effectively integrated into existing infrastructures. 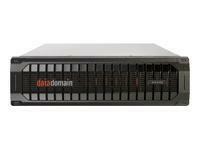 Massive Data Reduction: Driven by Data Domains fast, inline deduplication and compression technology, Global Compression, the Appliance Series offers an average 20x data reduction for backup images, enabling cost-efficient, long-term retention. Fully Compatible with All Leading Enterprise Backup and Archiving Software: The Appliance Series is designed to easily integrate into the existing backup infrastructure  either as a file server or virtual tape library (VTL)  supporting all leading enterprise backup and archiving software. High Throughput and Extended Retention: The Appliance Series delivers up to 800 GB/hr of throughput (exceeding LTO-4 performance) and offers up to 1.25 PB of logical capacity, allowing months of online backup image retention and ensuring fast, reliable data restores from disk. Local and Remote Site Data Protection: Data Domain Replicator software enables Data Domain deduplication storage systems to function as a highly efficient WAN vaulting solution for DR, remote office data protection and multi-site tape consolidation. Advanced Data Integrity: Data Domains Data Invulnerability Architecture provides the best defense against data integrity issues with continuous fault detection and healing, and end-to-end verification of data recoverability at time of backup.